As ISIS has seen a shrinking in it's base in Iraq and Syria, it has reached to other areas in order to maintain their viability. Important to that claim of a sultanate in control of territory. ISIS militants have infiltrated the Philippines in Mindanao and have secured allegiance from the anti-government Abu Sayef movement. The hard line agenda has grown as the Moro font, the leaders of the insurgency, have failed to bring home any results form peace negotiations with the government, Chief among these concerns is the control of natural resources in the areas, which are abundant. Mindinao has a long history of conflict involving control over natural resources, dating back to the Spanish conquest of the islands 300 hundred years ago. These were often Muslim areas, but the Spaniards like the Japanese and Americans, found this area hard to subdue. Development of these resources has been long elusive. Muslim spice traders had come here 600 years ago and had converted people along their trade routes. The converted peoples were Buddhist and Hindu, a patchwork or religion that exists today in Southeasy Asia. Because of the lack of progress under negotiations from the Muslim Moro Front, they have backed the Abu Sayyef and the Maute groups, who have pledged allegiance to ISIS. There are both local fighters, as well as regional, and international actors. The 2017 crisis occurred when government forces attempted arrest Isnilon Hapilon, a leader in the Maute Group. His supporters responded with the take-over of city institutions. The United States has provided technical and logistical assistance to the Filipino forces. Most of this has been in an advisory capacity. They have also provided technical data from drone missions. The natural resources in the region include first of all fertile soil and relatively healthy eco-systems which would ordinarily be magnets for tourism if not for the conflict. The region is also regarded as the food basket for the country. One article notes that there are deposits of "gold, copper, nickel, manganese, chromite, silver, lead, zinc, and iron ore. According to data from the GRP Mines and Geosciences Bureau, up to 70 per cent of the Philippines' mineral resources may be in Mindanao." Naturally there will be counter-trends when weighing tourist and mining extraction industries which sometimes come into dispute. The region is extremely poor. Data show that 11 of the 20 poorest areas in the Philippines are in Mindanao. 11 of 20 Poorest in Mindanao Some argue that the abundant natural resources could be an enticement for concluding a peace treaty. These resources, if properly managed, could provide incomes and jobs for the residents. 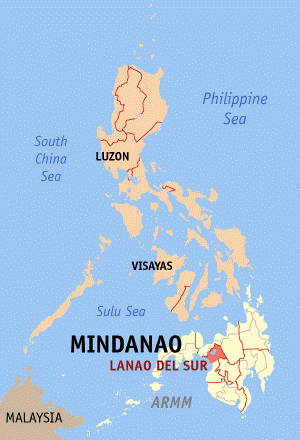 The city of Marawi is located on the Island of Mindinao. Source: This file is licensed under the Creative Commons Attribution-Share Alike 3.0 Unported license. The beginning date is when Isnilon Hapilon of the Abu Sayyef Group declared allegiance to SIS. Marawi is located in the province of Lanao del Sur, one of several in Mindanao. Marawi is a town of 200,000. It is 99.6 percent Muslim and has mild form of sharia law which applies mostly to personal matters. Militants took over the city of Marawi in May 2017, killing scores, after the arrest of one of their leaders. The Maute Group was formed in 2013 and declared allegiance to ISIS the following year. 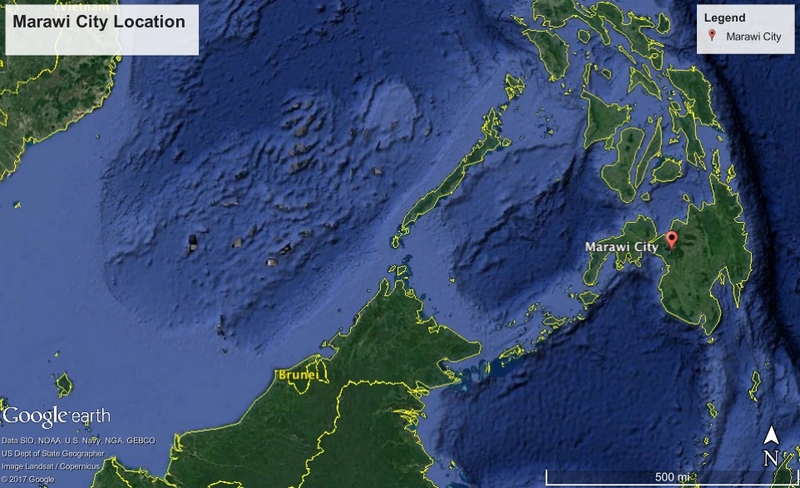 It's base was centered around the city of Marawi on the island of Minindao.